MJR Pay Franklin called Zuko was the lucky boy getting adopted today at the Valentine Event hosted by the Fiehrer GMC Dealership in Fairfield Twp. 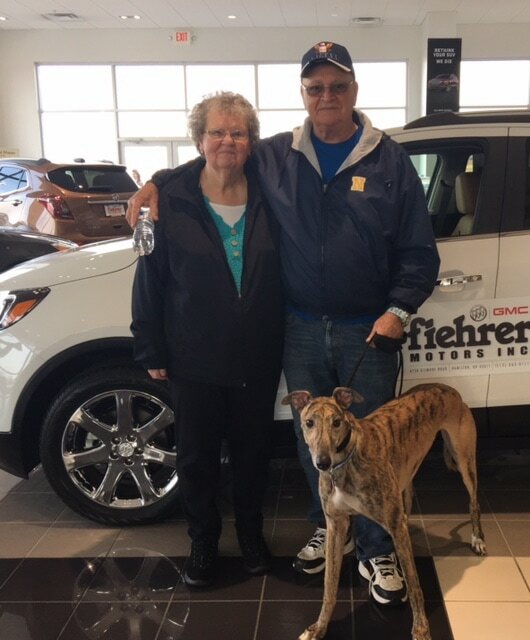 Clyde and Shirley, who live in West Chester, have had several greyhounds and after losing their sweet Annie the house was just too empty. They met Zuko and signed the adoption form. He was the lucky boy to go home today! And they are already talking about a friend for him in a couple weeks!